The MP for Bexhill and Battle said he was so confident EU citizens would not have to pay to apply for UK residency after Brexit he offered to cover a constituent’s costs. 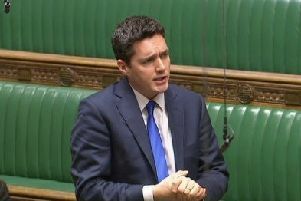 Speaking during Prime Minister’s Questions on Wednesday, Huw Merriman MP said he had ‘rather foolishly’ made the agreement during a public meeting. According to Theresa May’s withdrawal agreement – which will be voted on next week – EU citizens will be charged £65 to apply to gain their rights of UK residence when the UK leaves the EU. Referencing public meetings in Bexhill, Battle and Heathfield where concern was raised by EU citizens as to the cost and complexity in obtaining their rights to remain after Brexit, Mr Merriman urged the Prime Minister to reduce the proposed cost. Confirming he will vote for the Prime Minister’s deal on Tuesday, the MP said: “There is one particular aspect that I would like the Prime Minister to look at for which I have to declare a rather rash financial interest. It relates to P33 of the Withdrawal Agreement where citizens’ residency can either be provided free by the UK government or commensurate to existing cost. “I rather foolishly, in a Brexit meeting in Bexhill, was so confident that this would be provided free by the Government that I offered to pay any charge to one particular European citizen who was not quite as confident. In response to Mr Merriman, the Prime Minister said she ‘recognised the concerns he has raised’ and added that the fee of £65 to apply for status under the scheme was in line with the current cost of obtaining permanent residence documentation which would contribute to the overall cost of the system. The Prime Minister told Mr Merriman that the EU settlement scheme ‘actually will make it simple and straightforward’ for people to get the status they need. Speaking after the exchange in the House of Commons, and following a meeting with the immigration minister on the same day, Mr Merriman said: “This is a matter which may unite voters, regardless of how they voted in the referendum. “Citizens from the EU, living in this country, will now have to apply for residence in order to keep the same rights which they were granted when they arrived here. “The application process comes about because of the referendum so it seems fair to me that we should absorb the cost accordingly. “If the application is as straight-forward as I am told, it should not cost £65 in any event. “If I could find the lady I promised to pay any fee for, then I absolutely will. My real aim is to ensure that no one has to pay at all. The MP said he has committed to work with MPs across the political divide to further press the case.